Re: Anyone make a full exhaust system? Yeah the check engine light. Usually changing the catalytic converters into something more free flowing will engage the CEL. Where are you? I custom Fab'd mine for $850 installed. I would also like to know if there is some way to get a full exhaust system on the V coupe without having to void the warranty with a tune. B&B just finished making headers for cts-v. They also have a catback exhaust for the v-coupe and v-sedan. I'm happy with mine. I would love to know more about the B&B headers! Would it be too loud to run headers with a midpipe that has an aftermarket hi-flow cat, and the corsa sport cat-back? I want to be pretty aggressive with my exhaust note, but don't want it to sound raspy or cheap. Has anyone installed headers to the stock midpipe with an aftermarket cat-back? Im trying to find someone who will custom fab a performance exhaust for a 97 STS with the 4.6 N*? Would u be able too or know someone who could or is there a company that makes a header back system for it? I would apreciate any help! Thanks!!!! Stainless Steel Works makes a full exhaust. We do make a full exhaust for the CTS-V sedan and wagon. I haven't gotten a coupe into the fab shop yet to see what we need to change. Volunteers? 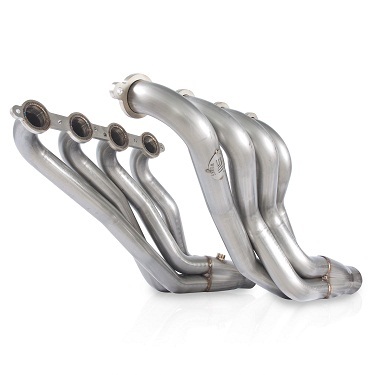 Cadillac CTS-V 2009+ Headers have 2-inch primaries with 3" lead pipes. 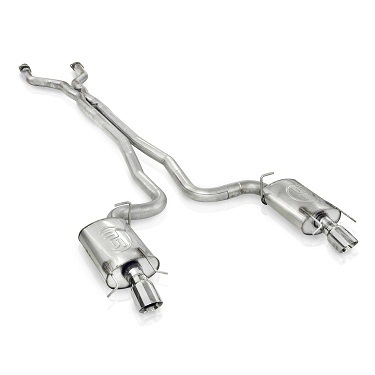 Choose between high-flow catalytic converters or off-road leads. Pick your connection: Factory Connect to fit to the factory exhaust or Performance Connect to fit to Stainless Works CTS-V exhaust. Improve performance, sound and mileage with our Cadillac CTS-V 2009+ Exhaust. Made from high quality 304L stainless steel, catback includes Dual Turbo mufflers, X-Pipe and slash-cut conical double-wall tips. Choose your fit: factory connect (to factory manifolds) or performance connect (to Stainless Works CTS-V headers). Everything we make is from 304L stainless and carries a lifetime warranty. can you send pics of the rear bends by the mufflers? were you able to get it built with all mandrel ?